A shortage of sheep has led to a famous landmark in Dorset disappearing under vegetation and moss. The 180ft (54.8m) famous fertility symbol Cerne Abbas Giant was also left struggling under plant life encouraged by a wet start to the summer. A flock of 100 sheep is usually lent to the National Trust for a few weeks in May to graze on the land. But a shortage has forced the trust to re-chalk the etching. It is hoped a flock will be on the hillside soon. Rob Rhodes, National Trust head warden for west Dorset, said: "Every year we have sheep on the hillside eating the grass to keep the giant visible. "We rely on local farmers and the way agriculture is going at the moment, there's hardly any sheep left in that part of Dorset." He added that the wet weather had caused a lot of moss and lichen to grow on the giant making the white chalk a greeny colour. "He is not completely invisible but he is quite overgrown," Mr Rhodes said. 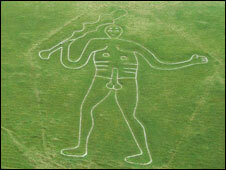 The first record of the giant, also referred to as the Rude Man, dates back to 1694 and he is now a Scheduled Ancient Monument. Many believe the figure is a symbol of ancient spirituality and fertility and he has been used to advertise products as diverse as condoms, jeans and bicycles. During WWII, the giant was disguised to prevent the Germans using him as an aerial landmark.